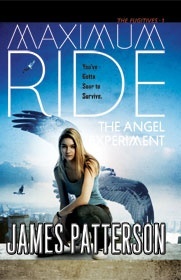 For Part One of our Big Podcast Crossover Event, we bring in Kait and Renata from the Worst Bestsellers podcast to help us out with a bestseller that is, in fact, Just The Worst: James Patterson’s The Angel Experiment: Maximum Ride. It’s supposed to be something like The X-Men crossed with Twilight with hints of Frankenstein and family drama, but it ends up much more like 1982’s non-blockbuster film Six Pack with moderately less Kenny Rogers slash stock car racing and significantly less charm. Luckily, the Cheersome Foursome helping you come to terms with this eventful yet plotless morass deliver more charm than you can probably handle! If you’re ready for six urchins, countless henchmen and somewhere between zero and one parents, you just might be ready to go on this wild slow minimum … Maximum Ride.